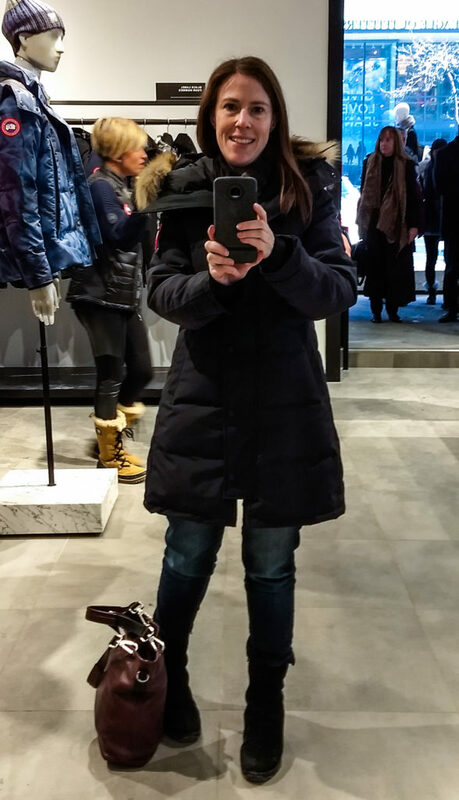 I’ve written at length about the challenges in finding a petite-friendly winter coat that’s warm enough to tackle Canada’s winters. 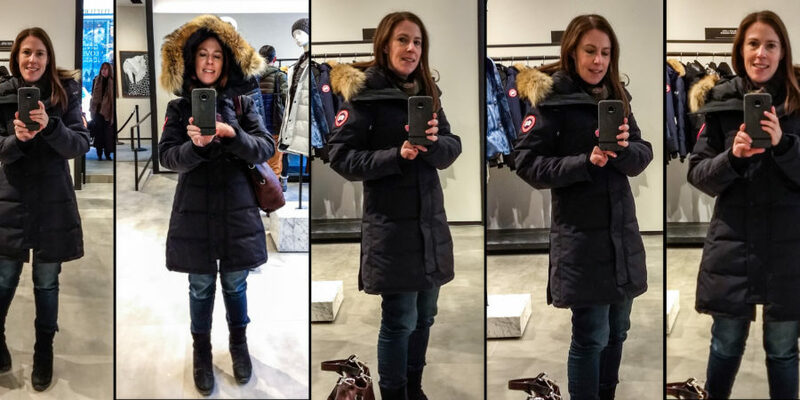 When I heard that Canada Goose, one of the world’s best known and most prestigious outerwear brands, had released a new petite-friendly fit called Fusion Fit, I was intrigued and just had to check it out. Unlike a petite fit, which scales down mostly for height, Fusion Fit scales down everywhere. So yeah, you get the higher waist, shorter sleeves, and narrower shoulders. But they have also scaled down for significantly smaller bust and hip measurements, which statistically are more likely to be found among women of Asian descent. This means that if you’re a curvier petite, this fit might not work for you. Now, slight rant: I should note that even the term “Asian fit” is kind of iffy. Which, presumably, is why they called it Fusion Fit in the first place. After all, Asia is a big continent — people from Iran or India are technically just as “Asian” as people from China, Korea or Japan. Also, while statistically certain sizes may be more prevalent among people from certain ethnic backgrounds, that’s definitely not always the case — there are certainly taller, larger or plus sized women with Asian ethnicity or heritage, just as there are very small or petite or slightly built women from European or other ethnic backgrounds. But Canada Goose was obviously targeting what they see as untapped demand from a growing and under-served market when they developed this fit. The high prices of Canada Goose jackets have put a lot of people off from buying them, so obviously someone at head office ran the numbers and figured out where a lot of their sales figures were coming from, and made some product fit decisions accordingly. For comparison, here’s Canada Goose’s standard women’s size chart: You’ll notice that at each size, the bust and — crucially for petite pears like me — hip measurements are quite a bit smaller than they are in regular sizes, clearly targeting a slighter, more straight up-and-down body type versus a curvier one. I’m typically a Women’s Small in coats in everything but height. The Standard women’s Small was designed to fit a hip measurement of 38-39″, versus the Fusion Fit Small, which is designed for a hip measurement of 35.5″-37″. That’s a significant difference. My hip measurement is typically around 36″, so in theory, the Fusion Fit small should still fit me. 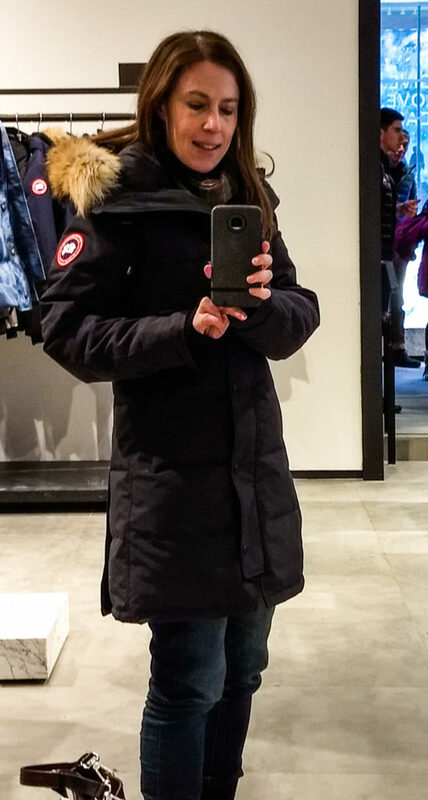 But when I’d previously tried on Canada Goose coats, the Standard Fit Small was the best fit on me (versus the XS suggested by their size chart), since you really want winter coats to be able to fit a bit loose over layers of clothing. Accordingly, would I need to size up to a Medium in Fusion Fit? Would the Small actually still fit properly, assuming the waist actually hit me at the right place? Would it be too tight on the hips? I was skeptical but I wanted to see for myself. 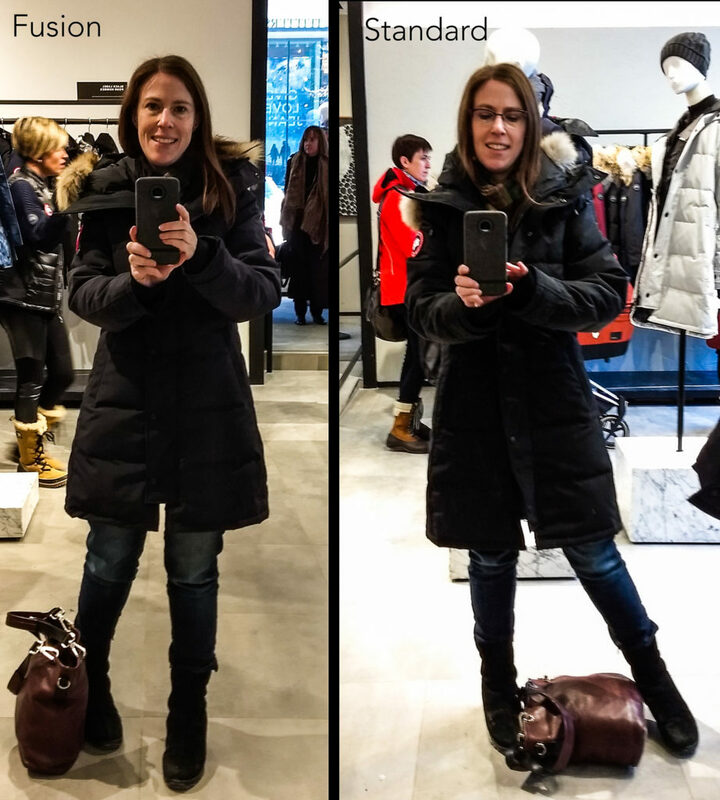 To test the Fusion Fit coats, I paid a visit to Montreal’s recently-opened flagship store, downtown on Ste-Catherine, on a blustery December afternoon. First of all, shopping at Canada Goose is an, erm, interesting experience, shall we say. Imposing bouncer-like security guards greet every shopper at the door, compelling you to check your coat and any bags bigger than a purse, and making you wait in a roped off area for a salesperson to be available. Browsing on your own seemed to be heavily discouraged, so I waited patiently. It wasn’t that crowded in the store, but it still took a while for a salesperson to greet me. Even then, he was busy assisting two other customers at the same time, and he seemed more interested in repeating the Canada Goose sales story than in actually answering my questions. 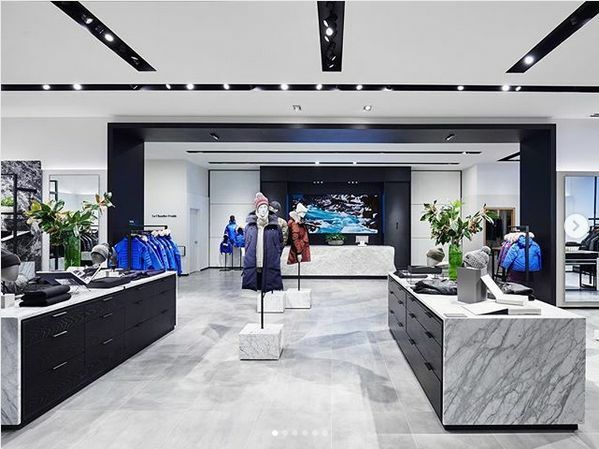 There’s a ton of square footage in the flagship store, but not a lot of it is used for coats: Only two small racks of sample women’s coats were actually out on the floor, none of which were in Fusion Fit. In order to actually try on any coats, you have to ask the salesperson to call down to the stockroom, and wait around for someone to bring the coat over to you. All of this is time-consuming and a bit frustrating, especially since there’s no real way to know what styles and colours are available beforehand. 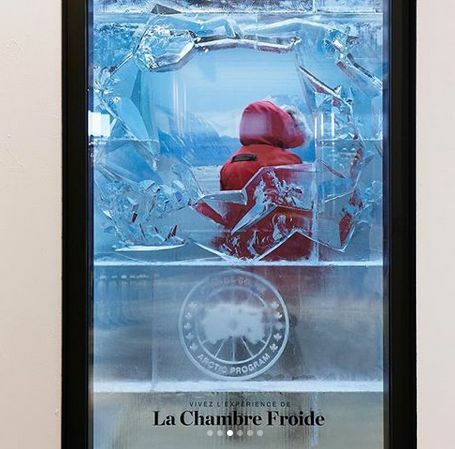 As you may have heard from the news, there is a cold room in the Canada Goose store, where the temperatures go down to -25. However, it’s hard to get a true sense of how warm a coat will be from standing in a windless room. I’d say this is more of a marketing gimmick than anything else. At my local shop in the Plateau where I bought my last winter coat, the salesperson (who knows me by now) simply let me walk outside in the coat for a few minutes. I can only imagine what the security guards at Canada Goose would think about that. Fusion Fit isn’t universally available on all of Canada Goose’s items. 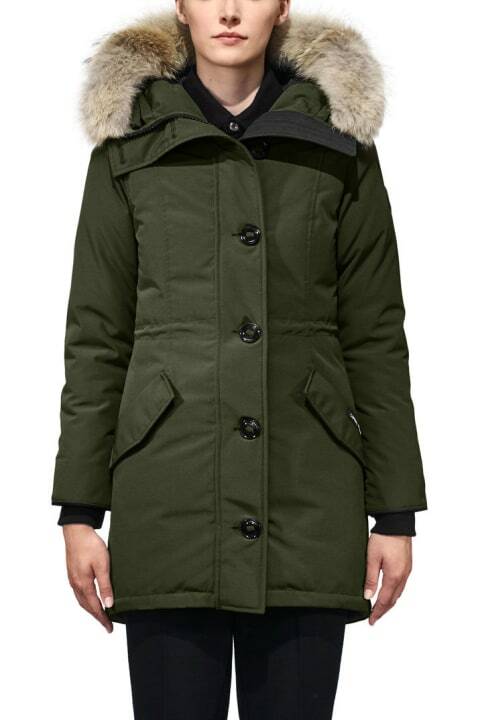 At the moment, for women, it’s only offered on 7 different parka styles, only 3 of which they had in store at the time: The Shelburne, Rossclair, and Trillium. In terms of warmth, Canada Goose uses something they call the “thermal experience index” or TEI. They rate all their parkas on a scale of 1 (lighest) to 5 (warmest). The Shelburne and Rossclair are their middle TEI-3 rating, for -10C to -20C temperatures. The Trillium is slightly warmer at a TEI-4 rating for -15C to -25C temperatures. (There’s also a Fusion Fit version of the Expedition parka, rated TEI-5 for temperatures of -30C and below, but that is overkill even for Montreal). I should note that colour selection in store was also very limited for Fusion Fit. Online there are more choices, but in the store, I basically had the option of black or navy in all three parkas in Fusion Fit. In regular, there were more colours available to try on, but the Fusion Fit options seemed to be pretty limited. 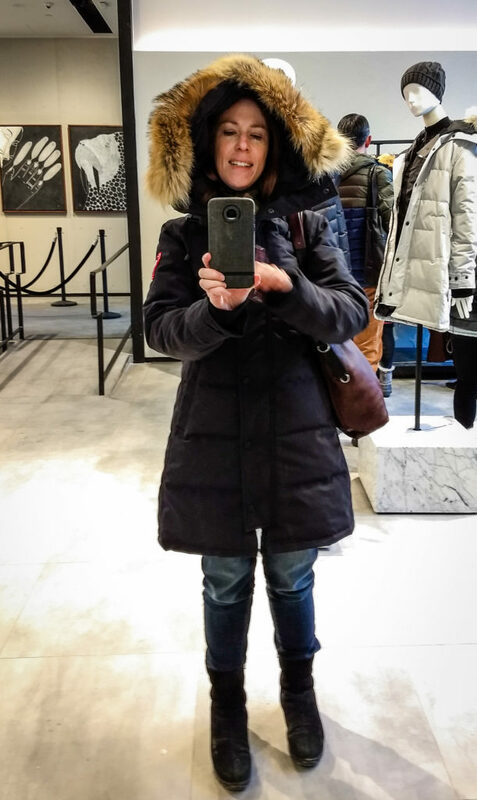 First, I tried the Trillium Parka in Fusion Fit size Medium. I’d asked for Small, but the stock clerk accidentally brought down the Medium and I didn’t feel like waiting, so I tried it on. The Medium was actually too big and baggy on me — I think the Small would’ve fit better — but the length and sleeves and shoulders were all instantly far better than they had been in the Standard Fit version. I could definitely see the difference in fit right away. 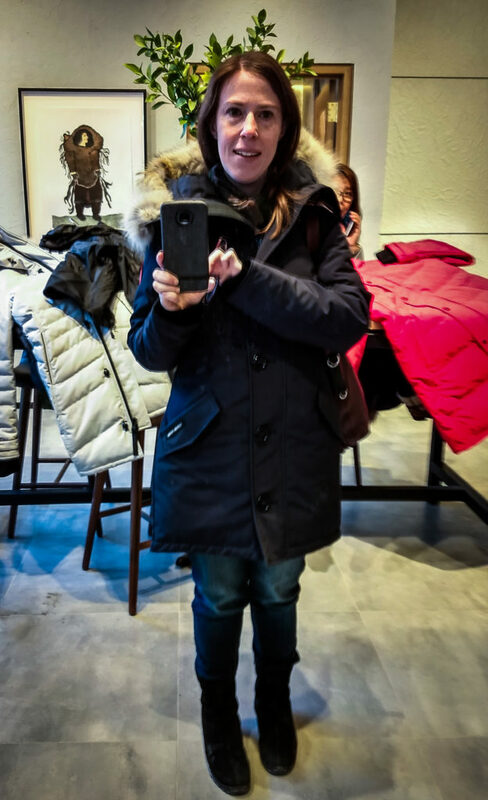 I didn’t like the style of this parka as much — the style seemed very boxy and the elastic band at the waist wasn’t flattering at all — so I didn’t bother asking for them to bring a Small for comparison. I also don’t have any photos of this one on me, unfortunately. So you’ll have to take my word for it. The Fusion Fit was instantly so much better than the regular that it was like night and day. The fit was flattering, slimming and lengthening on a petite frame. This is what a parka is supposed to look like! I didn’t even hate the navy colour I tried it in, though I’d also be curious to try it in graphite or admiral blue. Even the hood fit me properly. I mean, I can’t exaggerate how much I really liked this coat. 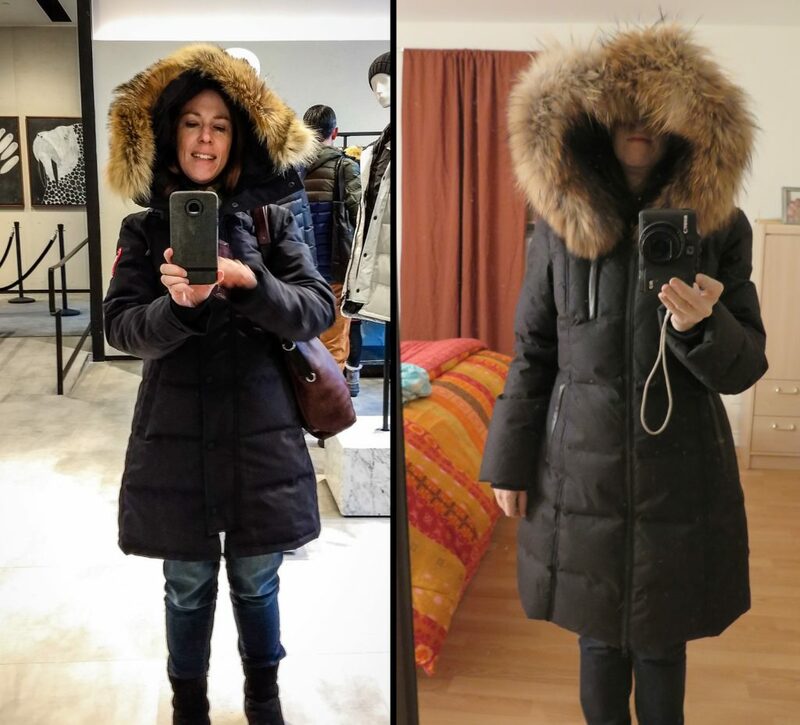 I’ve never tried on a petite-fitting parka before that worked for my frame, and I couldn’t believe what a difference it made. The waist actually sits at the right place in the Fusion Fit! The sleeve length, shoulder width, and coat length are also so much better on me. The only problem? The hip area, as I’d feared, was a bit snug. Not so tight hat I couldn’t zip it, mind you. And better than it was on the Standard Fit, where the waist fell too low and was actually trying to close around my hips. But snug. The Shelburne is a more fitted style than the other parkas, so it was actually worse on this one than on the other styles. I could’ve tested sizing up to a Medium, I suppose, but I didn’t have the patience to wait for the stock person to bring another size. And it did fit properly everywhere else. But it did mean that it would be hard to layer this over a big sweater, or, for that matter, sit down comfortably without unzipping the double zipper or unsnapping one of the side snap areas. Not ideal for a winter coat. 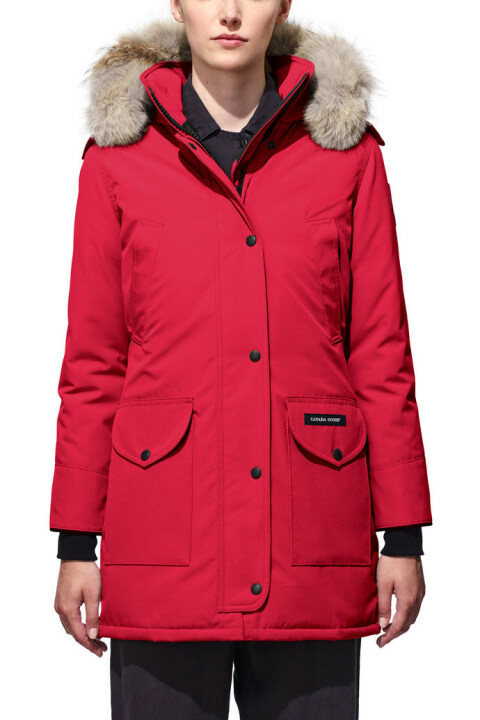 The Shelburne was actually my favourite parka of the three. The style is flattering and seems to dress up as well as down more easily than the other two. But the tighter hip measurement is definitely an issue — an extra inch or so of room around the hips would’ve made this so much better. This is where the difference between “Asian Fit” and “Petite” really becomes apparent, especially for those of us shorties who are bigger around the hip area. I found the style of the Rossclair to be somewhat boxy and much more casual looking. The styling made me look shorter, versus the Shelburne coat, which I felt made me look taller. And I didn’t like the diagonal flap pockets, which actually served to call attention to exactly the area I was trying to avoid. I had also tried on the regular in the Rossclair Parka to compare to the Fusion Fit, and the difference was significant, with the Fusion Fit the clear winner. But I wasn’t a big enough fan of the Rossclair style to spend much time with it. So would I buy a Canada Goose parka in Fusion Fit? Erm, maybe. I won’t say I wasn’t tempted. Maybe if I hadn’t dropped $600 on my current winter coat a mere two years ago, it might be easier to fathom the idea of spending a grand on one of these. But these prices are no joke, and a winter coat is meant to be a multi-season investment. And Canada Goose doesn’t even discount or go on sale, ever. So I couldn’t even, say, wait for a Black Friday deal. Yes, my current coat does kinda drown my frame. But it’s perfectly warm and good quality and, most importantly, already paid for. And it will likely last a number of years more, so I’m not quite financially ready for such a big investment again. Also, if I were to buy one of these coats, I’d probably go back and try it on the Fusion Fit in a size Medium first, at least for comparison. Buying a winter coat that’s a little snug around the hip area would give me serious pause, especially a coat I would plan to wear for many seasons. Many people believe that Canada Goose coats are overrated and overpriced, that the company is coasting on its name and branding, and that similar quality and warmth is available for hundreds of dollars less from other, lesser-known brands. But none of those other brands have bothered to release a petite fit. Canada Goose may be changing the game here, and I have to give them credit for that. I selfishly may wish that they had gone with a more standard petite rather than their Asian fit sizing, since I find their Fusion Fit to be made for a more straight up-and-down body type and not really for those of us with more curves. I understand the business reasons for their decision, though. And hey, I suppose it’s refreshing to see that there’s at least one product that’s made in Canada and selling like hotcakes in China, rather than the other way around. 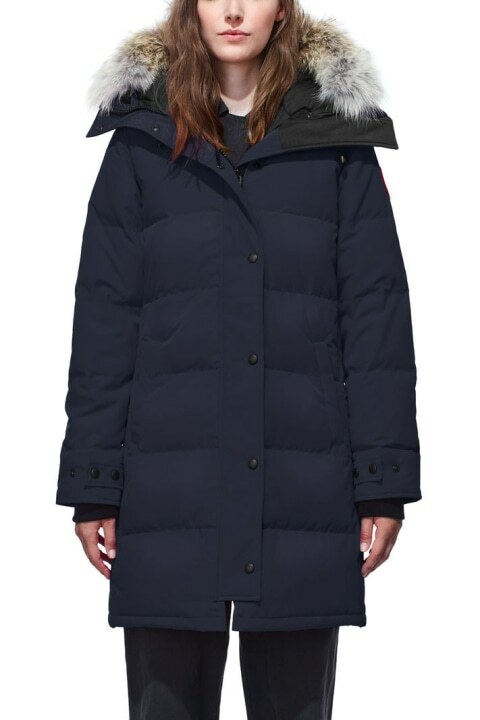 At least Canada Goose is acknowledging that shorter women exist and need coats too. Here’s hoping that they release more styles, colours and options in Fusion Fit in the future. And that more brands take note and follow suit. 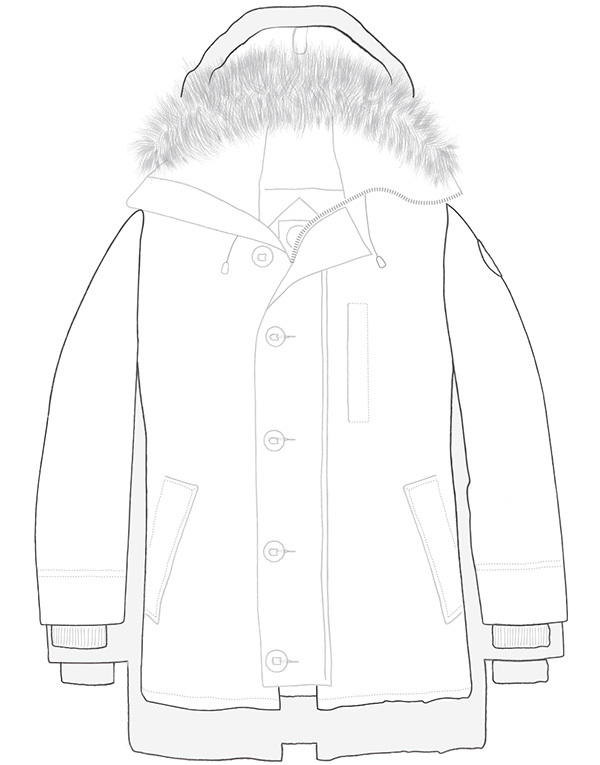 Have you tried the kids’ size Canada Goose parka? While visiting Yellowknife a few years ago I bought a kids size xl epedition parka from the Weaver and Devore store there. Great fit, even a little loose. Less expensive, and nice colors. Mine is red. And nine – count em-nine! pockets. 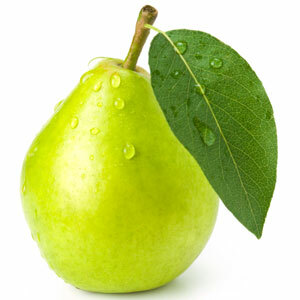 I’m 5.0 feet and rather straight up and down, with a slight pear shape. And I don’t always need to carry a purse when I’m wearing it. (All those pockets!) . Thanks! Actually, I did test their kids’ sizing on a whim a couple of years ago but it doesn’t work for me at all — definitely not enough space at the bust or the hips for me, and the armholes are too high and awkwardly placed. If you read other parts of this blog, you’ll see why kids’ sizing is rarely a good suggestion for petites, unless they happen to have a body shape that is very tiny all around with few curves. It sounds like that might the the case for you, but for most of us, it isn’t really an option. To get an idea of how long the coats are, how tall are you?